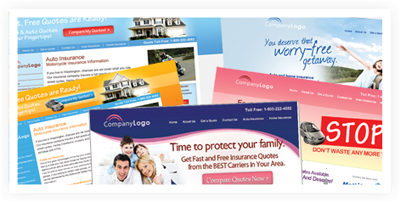 Insurance Web Pros has been designing, building and marketing professional agent and agency websites since 2001. We are a California based Corporation with offices in Thousand Oaks, California. Our team of Designers, Developers, Programmers and Online Marketing Specialists has one goal in mind: Growing your business. "A funny thing happens without Marketing. Nothing." At Insurance Web Pros we know you need marketing 24/7 - 365 days a year to succeed. Our expertise extends to much more than the Design and Development of beautiful full featured Agent/Agency websites, we have been marketing Professionals, Businesses and Corporations online for over 15 years. Our other companies: GOiMarketing.com and RealtyTech.com have been specializing in the Corporate Marketing and Real Estate website and marketing industries respectively for over ten years. RealtyTech Inc. has over 5,000 real estate agent clients worldwide, while GOiMarketing Inc markets some of the largest corporations in the world including MetLife Inc, Dover Corporation, FOX television and more. Our expertise in Design and Marketing has won us several awards including a Television Emmy for graphic design; a Mobius for marketing excellence and many other website design and functionality awards. Your success is our number one goal. Each and every Client is treated with care and understanding to help you succeed in the Insurance business. Please feel free to call us today to speak with a Marketing Advisor who will help you design the products and services you need to grow and build your business.